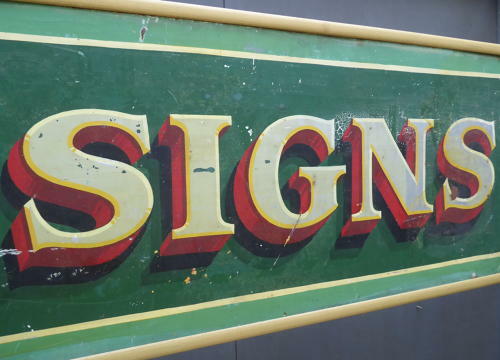 A wonderful original Signwriters trade sign. A beautiful hand painted & framed sign featuring some superb workmanship & outstanding traditional sign writing. The triple shadowed lettering has been applied in some beautiful vivid colours & the meticulous attention to detail is consistent throughout, demonstrating the extent of the signwriters capability just as it were intended. The sign is on thin metal & being double sided, would originally have hung from a bracket with both sides visible.